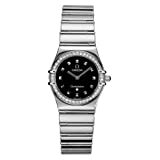 The Omega Women's My Choice Diamond Bezel Watch is an exquisite timepiece that flaunts its elegance with a stainless steel and diamond bezel. 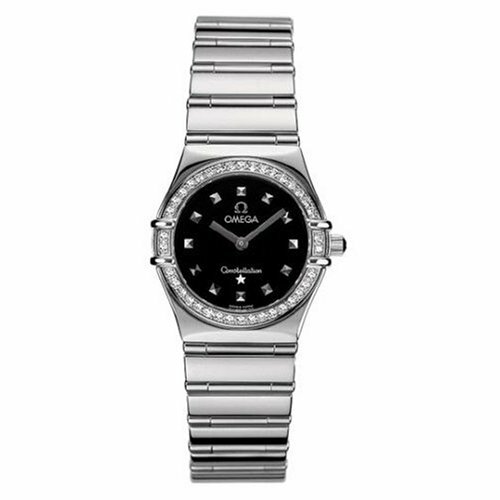 Silver tone hands and hour markers offset the deep black dial. This timepiece runs on quartz precision movement with rhodium-plated finish and features a domed, scratch-resistant sapphire crystal coated on the inside with anti-reflective treatment. While the Constellation is certain to turn heads at your next dinner party, with a design that's water resistant to 99 feet, it is also certain make a splash at your next beach-side resort or yachting adventure.